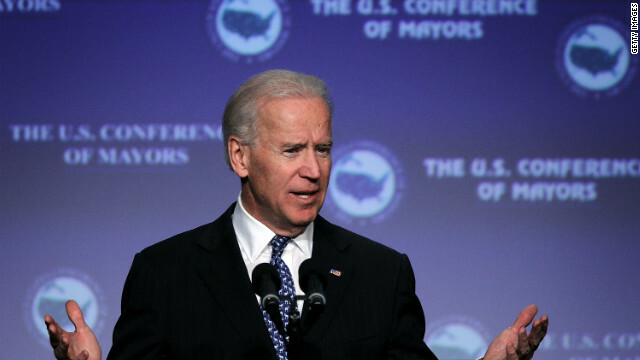 (CNN) - Joe Biden tops a list of Democrats who may be interested in a 2016 presidential bid, but appears to have stepped a bit ahead of himself Saturday. Video posted online by the site Mediaite shows the vice president stumbling over his title at an inauguration party in Washington. "You saw what America came to see. You saw early on, Iowa Democrats saw early on the incredible promise and the incredible capability, the incredible leadership of the guy I now serve with," Biden told supporters at the party, sponsored by the State Society of Iowa. "I'm proud to be president of the United States, but I'm prouder to be Barack ..." he continued, trailing off as laughter erupted in the room. "I am proud," he corrected himself, speaking over the crowd, "to be vice president of the United States." If he was testing the waters for a presidential bid, he found a sympathetic crowd from the state which kicks off the presidential selection process with their caucuses. The video shows him chuckling as he said, "Well, there goes that," and attempted to move on. "Look, on a serious note," he started, as some in his audience continued to laugh. "I guess I'm not going to get back to a serious note, am I?" After a few false starts, the video shows Biden regained his composure. "Think of where we were when Barack was elected president of the United States," he said. Perhaps Biden will find forgiveness from President Barack Obama, who once slipped up and offered Biden the same promotion to the top of the ticket. When he introduced Biden as his running mate in August 2008, Obama called Biden "the next president of the United States," then quickly corrected himself. Republican presidential nominee Mitt Romney made the same mistake last year when introducing Rep. Paul Ryan to his ticket. The music played and Ryan walked out waving. Once the applause subsided, Romney stepped back to the microphone to correct the mistake. Lucky for Uncle Joe he's not a Republican. He would have been banished from Planet Earth for a mistake like that. I do the same thing all the time. Everyone can relate to making mistakes but Joe Biden has a consistantly hillarious way of screwing up in front of a camera. Gotta love Uncle Joe. I can't wait to see how Fox News turns this into a big flare up between Biden and Obama. The people at Fox never let facts get in the way of a good story that's critical of Democrats or that's highly supportive of Republicans. Fair and Balanced? Sure. Only idiots believe that. Do they need "Hello! My Name Is" tags with their title underneath?! Please, please, PLEASE put up Joe Biden in 2016. The GOP begs you. Congratulations Mr Vice President and Mr President! Don't worry Joe, next election you will be President!!!!! GOP will be the thing of the past, they did their selves in drinking tea!!!! Why should anyone be suprised at Biden making himself look foolish in public. This is not the first time and it won't be the last!! Funny as hell – I Love Joe!! If he would team up with Hilary. I think Dem will have an enormous chance to win in 2016 as long as Obama doesn't screw things up. I wish him good luck! Biden seems like a decent guy but he's too old. Biden you need to slow your row, an take your time before you speak an what your during. Great Joe. American people love you.